Eric Knaus, a.k.a. The Great Zucchini, invites you to see firsthand why he's Washington, DC's master entertainer for the Nursery School set. You join the little tykes, in a front row seat, to watch one of his full-length shows. Uncut, unedited, just like the kids see with complete with all the silliness and gags that young children love. Along the way, you'll go behind the scenes with Eric, as he reveals ideas and techniques he uses to make children love his work! This video is the perfect complement to The Great Zucchini's previous release, Kidshow Rockstar. If you entertain young children, or are considering getting into the often overlooked Pre-K market, you need to see The Great Zucchini LIVE! At AmazeKids, we highly recommend this 90-minute DVD. It includes Eric's full show with an option to hear the commentary. Watch The Great Zucchini Live and we guarantee it'll change the way you think about entertaining three- , four- , and five-year-olds. Community questions about The Great Zucchini Live! 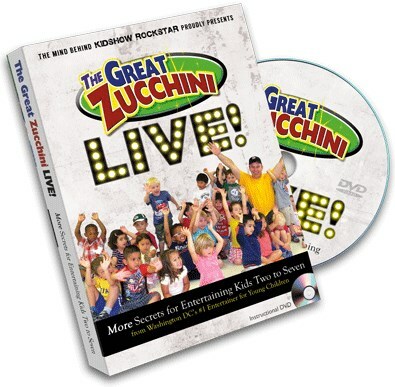 Review The Great Zucchini Live!